We're completely blown away by Raster Noton at the moment. There used to be a time, back in the mid-late 90's, when we had a total obsession with the work of Uwe Schmidt, aka Atom Heart, aka Atom Tm. His seemingly endless series of albums for his own 'Rather Interesting' label not only displayed a visionary ability to harness technology into an ever-changing series of pseudonyms and personalities, but also somehow managed to do so with the kind of attention to detail and brilliance that would soon make him a true musician's musician - a real connoisseur's choice. His work ranged from the uncompromising miniature machinations of Dos Tracks to the curious romance of Erik Satin, the spacious electroid genius of 'Brown' and the reduced machine funk of 'Schnittstelle' and 'Dropshadow Disease'. Then came another landmark album - "Pop Artificielle", recorded under the 'Lassigue Bendthaus' moniker and featuring a collection of mindblowing cover versions delivered via speech synthesis using a process that could only have been deeply laborious but which to this day remains one of the most impressive alternate takes on pop music we know. Schmidt would soon become a victim of his own genius, however, giving the world the tiresome Señor Coconut project which would fast send him to pretty much every music festival and bad novelty compilation going - and, despite the odd flash of brilliance here and there, we just slowly and almost completely lost interest. Raster have long been used to bringing the best work out of their impressive family of artists, but this unexpected new Atom Tm album not only represents a landmark release for the label but also just happens to be Schmidt's first truly important release in a decade - and by some distance the finest thing he has released since 1999's acclaimed DOS Tracks. 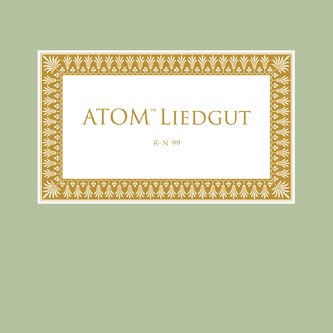 'Liedgut' is built around some familiar Atom signatures, ranging from the incredible pop intricacy of "Wellen Und Felder" (like a more advanced, textural, alien take on "Pop Artificielle"), to the hardware funk of "Im Rausch Der Gegenwart I" (constructed around the sound of mobile phone interference and reminiscent of the first and best Flanger 12"). But there's a whole new over-arching aesthetic to this material, the album itself opening with a couple of incredible drone/early-electronic stye pieces that just ooze a warmth and deep musical understanding, while tracks like 'Weisses Rauschen" sound like Raymond Scott's "Soothing Sounds for Baby" taken a step further into a weird and wonderful world of music out of time. The most significant thing about 'Liedgut' is that Schmidt seems to have recovered his confidence to create uncompromising music that takes its time, foregoing the frenzied digital editing that typified so much of his work back at the start of the decade, and in its place painting a new picture full of contrasts and, sometimes, utterly breathtaking beauty. If you're an old time follower of Uwe Scmidt's work you'll desperately need this album in your life, if you've yet to discover any of it - now really is the time to get acquainted. A truly exceptional album and a truly essential purchase.